This past week before Spring break was a busy one. Check out these pictures !!!!!!! I had some time to go over the evaluations. I was asked why I don’t allow for lab time at the end of class. The reason is that everyone gets up and leaves when the lesson is over. Also, for the students who get out of work around 5, it takes them time to get to class, so for their sake, starting the lecture/demos at 6 gives them time to make it on time. I try not to start before 6 pm. Sometimes, I am asked to start early. Some of you, wanted time to repeat the portfolio lesson a second time. The class is just not long enough to do this. No, I will not supply coffee and donuts in the class. Only clear liquids are legally allowed in the classroom. 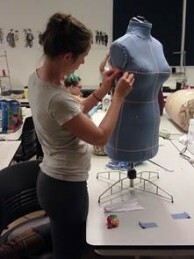 Sewing swimwear, lingerie, alterations, and dance wear are taught in Sew Like a Pro classes. Learn the basics first. By the end of class, you should be able to read and understand a commercial pattern. I can’t keep assignment vague. 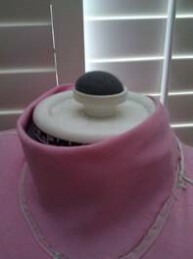 You need to complete dressform so we can move on to learn the industry method of draping. The closest I can come to being vague, is the dress you are going to make for the fashion show. The supply requirements are as accurate as I can get them. I always find I forget things. Each class is a bit different in their needs. Some of the students want a list of things they just need to begin the course. This caused confusion for some of you. So I asterisked the items that you need on April 1. I don’t know which way is best until I run the class on April 1 and see what everyone brings. 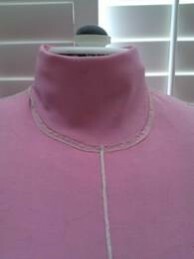 When we begin draping on our dress forms, the class organization will change. Lectures/demos will begin at 6 pm. All the points of the class are in the text book. You will need required text on April 1. Giving out the evaluations early in the course was NOT my idea. And I cannot change it. 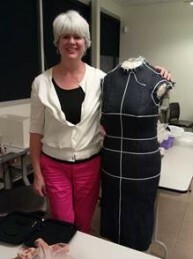 I am going to try to teach Patternmaker computer patternmaking in the fall of 2013. 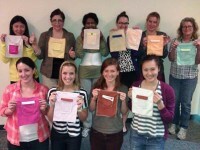 As to bling, sequins, rhinestones, and fabric dying: this is part of the textile embellishment course. I am teaching this, this summer. You will be able to add bling to your purses. A lot of what you want me to write on the board, is written in the syllabus – class by class. April 1 is the first day back from the Break. See you all in class !!!!! Portfolio: Last week, we learned about closures: shank and sew through buttons, snaps, hooks and eyes. We got into raw edge applique and sewing on patches. Last Thursday, we learned all bout pockets. After the Spring Break, we have 3 classes left. We will learn about hemming, zippers, and buttonholes. Your shoe boxes are due on April 9th, along with your Portfolio Grading Sheet. I always look forward to you moving on to making PJs. You will be using all the skills you learned in the Portfolio class. You are all invited to the Dutch Treat Dinner going on – Wednesday night, in El Cajon’s Tyler’s Taste of Texas. If you want more details, call me. Draping: I know, you are all excited to finish your dress forms !!!! 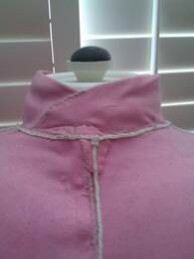 April first I will be teaching how to drape a bodice. Over the break, you need to do about 3 croqui pictures, finish your forms and arms. You are all as busy as I am, this week!!!!! 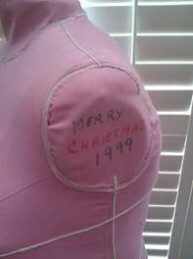 I want to end this email with pictures of a dress form I did in 1999. I think it will help you finish your necks. My mother-in-law did NOT have any children around. This is why the neck is left loose. When I did my dress form, in 1982, I had young children. My neck needed to be tight. Sara’s too. She has young kids with tiny fingers that can get caught in things. Check out the pictures. I am sure they will help you. If anyone wants to learn how to drape, print out the syllabus on the blog, www.sewalongwithjoanie.wordpress.com , and come prepared to drape on Monday, April 1. Yes, there are supplies you will need. I have home dress forms that belong to the school. You can use those to learn on. You are all welcome to come to the fandango dinner at Tyler’s. Call me if you want more details. Question: Who is driving up to LA on April 6th?????? Sew Pro’s Bus has filled up. So if you are driving…..I know students who will to pay for the ride up and back…….Let me know.